Received two orders. One from japan lure shop. And the other from I love hardbaits. I still don't get why we don't have access to them in shops here. Oh and another thing.......USDM Lucky craft lures....either don't come with hooks. Or...come with crappy dull hooks. Owner has #8 screw lock worm hooks. there are so many uses for those little guys...it's amazing they aren't usdm. 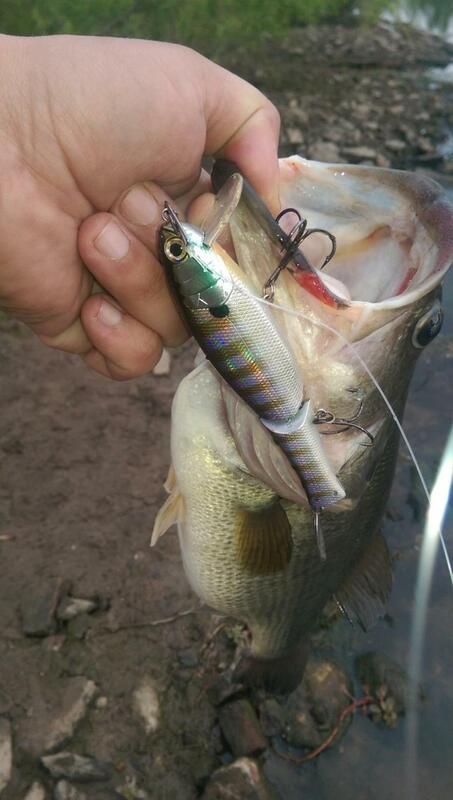 Gami and their Ti wacky hooks look to be winners...again...not usdm.....that is the shocker....senko style baits are a staple.....why only offer 1 hook. And clips.....mustad came out recently with their fastach clip....decoy had a welded version for quite some time. For rings? Studio Oceanmark now has epic splits......priced right too. Valley hill has rings smaller and pretty damn strong for the little stuff. Half the size of owner nings....good stuff and cheap. Daiwa brough over megabass.....I haven't really bought into their stuff that much. Shipwreck's firm just picked up evergreen international.....which is good.....but they aren't bringing in the whole lineup. Jackall is here......but missing a ton of baits. I'd love to see more OSP soft plastics and hard baits....but they are pricey....i love their DoLive range. Pretty funny though that i received a delivery from japan with free shipping......and TW hasn't even showed up...and the TW order was placed 2 days earlier and was paid for. I was never a big Lucky craft fan.....just their really big baits. the little guys i just got in look sweet.....I won't be buying any lucky craft baits locally....no way ...no how. Cheaper...better hardware....more variety....and their foil sticker finishes are clear coated (at least for the ones i received. Sounds like a lot of great tackle Scooby, but I have a different take on the smaller Lucky Crafts. I have been using them for over 8 years now and they are been killer for me. Lucky Craft has gone through an evolution in hooks though. Originally they used Stingers which I really liked, then they supposedly went with VMC, but they must have been a cheaper wholesale version which were not good IMO. Now they have gone back to Owners for their newest offerings. Some of their smallest offering have chrome plated hooks that I do not like so I replace them. Pointer Minnow 45sp, 65sp, 78sp,and 78sr-dicontinued, 100sp's all deadly. The 45's are tiny ultra-light lures, but great for stream trout, though I did get on humongous rainbow on them. The older Trigger minnows in the small sizes are deadly, but have been discontinued or are in very limited supply on this side of the Atlantic. Slender pointers 67mr, 82mr, 97mr, really good. Megabass 55x and 70x are really good, but very pricey for what they are and the Trick Darters and Ito Visions are killers, but fragile and very expensive. The OSPs and Imas are probably great, but they are a little large and heavy for most of my fishing. If they come out with smaller versions with metallic finishes I would jump on them, same with Evergreen. For my presentations and fishing I do great with metallic finishes though they can be tough to find, so I buy them up when I can find them. I primarily fish for smallmouth and trout these days and the largemouth market is the primary driver for most of these lures so many of the sizes and finishes that work great for me often get discontinued or are in very limited supply. I am always on the hunt for my favorites domestically and overseas and have had to special ordered some of my favorites to get them. Fortunately the Japanese market likes the smaller lures. They even use 45 and 40mm lure for saltwater which is amazing to me because I would never use something that small in the bays or surf. Yep. I've ordered a few things from Japan Lure Shop, Japan Angler and from Megabass Japan. The difference is quite noticeable and with the current yen vs. usd exchange rate the prices are much cheaper even with shipping. Some of the jdm colors and patterns are simply amazing. The 112 Mr slender pointer in chartreuse shad is deadly on smallies in the susky. My favorite color style and size for that body of water. Jay, I was hoping you would chime in. I think you have some of the most extensive knowledge of LC baits in the area. My experience with the small baits is very limited. My hardbait use had almost gone to nil over the past 5 years. Now that the singles are out. I'm getting back into them. Of the smaller baits i ordered from TW and my local shop in the past. All came equipped with crap hooks. They didn't even look like VMC's. 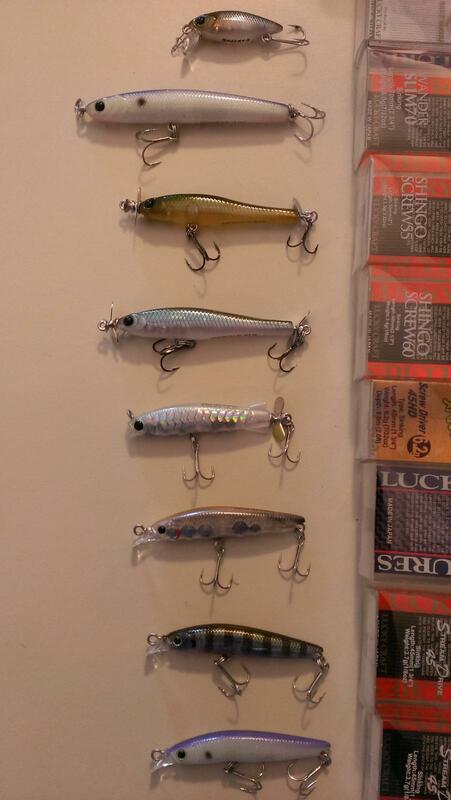 A few newer baits including a few cranks and spybaits from TW, BP and ebay...all had the same oddball hooks. The big flash 190's i have a bunch of.....1 or 2 had hooks....others just had loose rings no hooks. I believe it was to save on import fees or something as they were considered incomplete. Same with the big shad glide bait looking thing. No hooks on that one either. The baits i ordered from ebay....some had light wired chrome hooks(acceptable considering they are 45mm baits)...some black nickel....and the larger ones were definately owner stingers. None had the strange crap hooks. Ebay seller ILoveHardbaits is great...free shipping with 3 baits.....got here very fast. They have so many colors i've never seen...like....really never seen.. Good prices too. Last year i focused partly on finesse/ spybaits....this year I'm going to try going even smaller. Japan has a selection like no other for interesting tiny profile baits. These are going to be my starting point for the little guys. That flap tail lucky craft catches. Hmmm, you have an interesting collection there Scooby. It looks like you have some stream drives, shingos, bevy minnows. I have often wondered about the stream drives though I am not a big fan of the sinking models. They work well when the water is warmer, but the suspending lures work as well and excel during the cool and cold water period. The table rock shad is one of my favorite cloudy water colors and is a pale pearlescent green and purple, but don't forget the gold and copper metallics. I Love Hard baits is a great supplier, but like many USA Lucky Craft distributors the don't get all of the models and finishes. I really like their metallic scale finishes. 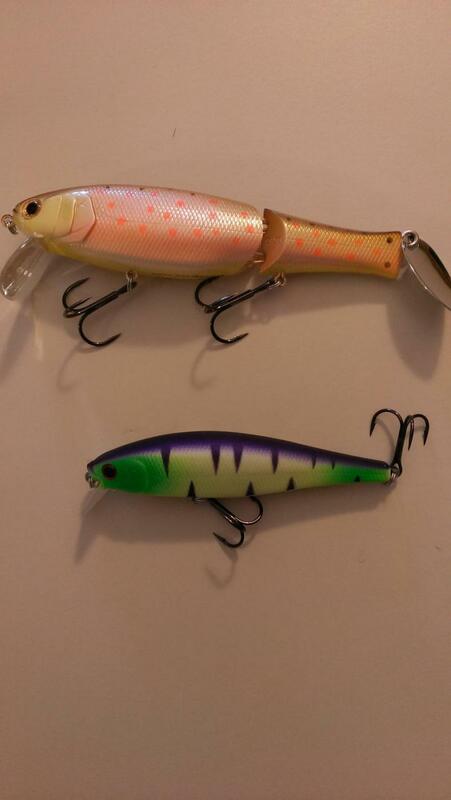 If you can find some Pointer Minnow 65sp and 78sp pointer minnows in metallic finishes I would start there. If you saw my lure kits it would probably drive you crazy and then I would have to kill you. Our Delaware guide grabbed my kits and spent 20 minutes trying to identify all the lures. Good thing he moved to TN to guide on the Holston and Watuaga. He said we would be lucky to catch and released 5 trout the day we went out with him and we landed about 50 over 19". He was flummoxed by the end of the trip. We were lucky, no pun intended. 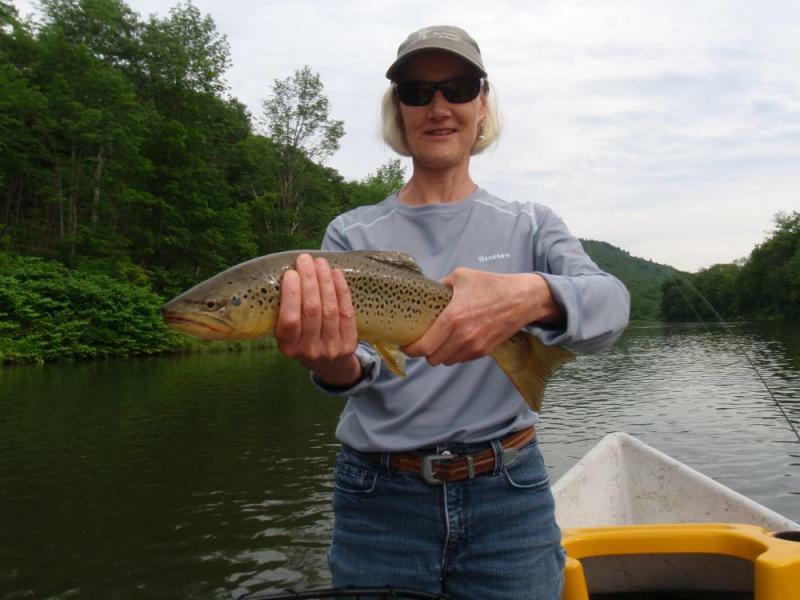 We had perfect river conditions with rising water levels and a little color in the water. I knew it was going to be a good day and I was thrilled that my wife Pat did so well. It was a trip of a lifetime for her. Every time her rod bent over and the drag started squealing she had a huge smile on her face. It really is interesting how everyone really does prefer different things. I recently transitioned to sinking baits...I used to be in the suspend suspend suspend camp for rivers. Always feared hangups with $$ baits. Switching to singles decreased that chance....and allowed me to see how fish react to a bait who's retrieve was killed...and allowed to sit on the bottom.......As long as the weight of the hook is what causes the bait to sink.. Slow sink baits will rest on the bends of the hooks..... Mind blown....Not something I ever realized......Getting back into hardbaits...this was eye opening. Some slow sink baits will do this too..but they will tail up when using lighter singles. I have a number of the Smith's and Japanese slow and fast sinkers and they have their place. The weighted balsa wood lures sure look sweet and they have some fancy finishes on them. They also have a fancy price though their popularity seems to be waning. The humpback minnows are also slow sinkers. As you already know you can make slow sinkers and slow floaters by changing the hooks. I have purchased and used so many stinger hooks that I should have bought in bulk when I first started. You have seen two kits, but there are a number of others. I also like to use different lures and different presentations because the fish have not become conditioned to them, but the fish have the final say as to what goes into the kit. Each kit is designed for the tackle, species, the size of the fish, and the fishing patterns that work well on the rivers I fish. I also have a number of small packs designed for holding plastics and terminal tackle because there are times when the plastics and jigs are deadly. I have five different types of test bed lures to try out this Winter and they won't get their place in a kit until they prove themselves. Once I see where and how they work I will know which kit. My friends tease me that the weight of my fishing vest helps keep me glued to the bottom while I am wading, but some of their sling packs are close to the same weight, especially my bud Mark who likes to bring way-to-many senkos with him. I knew it was going to be a good day and I was thrilled that my wife Pat did so well. It was a trip of a lifetime for her. Every time her rod bent over and the drag started squealing she had a huge smile on her face. You should pick up a pack of the single replacement hooks. And experiment on a few baits. You will get hung up much less. Ya ain't gonna toss a jerk bait into a beaver hut...but i anything non soft wood generally comes out with out issue. When I target warm water fish I usually go to my Keitech soft baits. So they are pretty expendable away.